Today's Historic District of Allentown runs from 12th street to 8th Street and from Linden Street to Liberty Street. Encompassing homes built from the early 1800's through the early 1900's, it stands as a unique mixture of Victorian style architecture. Like jewels scattered among the streets, there are wonderful homes with character, personality and histories that make each a treasure. Our residents know and appreciate these homes and our neighborhood and work hard to ensure they last and are preserved for all. These homes are surprisingly affordable and offer exceptional value. The quality of construction and attention to detail are exceptional. Offered properties range from beautifully restored to fixer-uppers, but all bring to the buyer a rich history, unique character and an opportunity to dwell in homes just yearning for families to love them again. 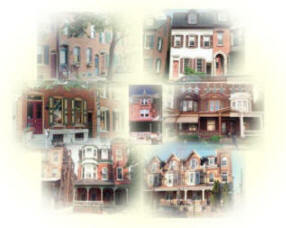 Many programs are available to assist first time home buyers and those who want to restore these fabulous homes. The Old Allentown Preservation Association, Allentown Neighborhood Housing Services and the City of Allentown are some of the resources that you can use to purchase in our Historic District. See our links page for contact information.